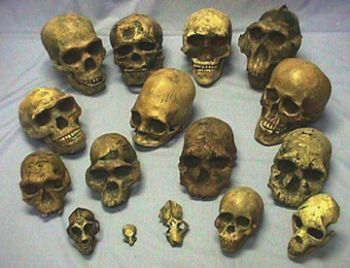 This is a collection of 17 of the more fameous Homidid skulls found all over the world. The skulls include but may not be pictured. See individual skull pages for more and better photos. 1. LUCY Skull reconstruction. (Australopithecus afarencis), specimen #288-1. 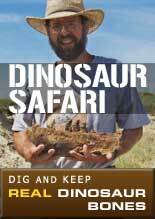 3-4 million year old. Prehistoric Planet Item Number 1387. 2. Peruvian Lady Skull, (Homo sapiens), Conical-shaped bound cranium of ancient Peru. Prehistoric Planet Item Number 1555. 3. SW Amerind Skull, Cradle-flattened cranium back. Prehistoric Planet Item Number 1563. 4. Adapis Skull from a prosimian of Eocene North America and Europe. Prehistoric Planet Item Number 1738. 5. Skhul 5 Homo sapiens Skull. Considered by many authorities as the hybridization of Neanderthal and modern human. 1929-34. Mount Carmel, Palestine. Prehistoric Planet Item Number 1562. 6. 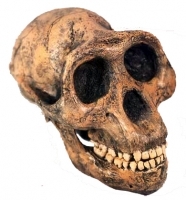 The Black Skull, (Australopithecus aethopicus). The manganese-stained cranium of the distinct evolutionary hominid lineage of 2.5 million years ago. Lake Turkana, North Kenya. Prehistoric Planet Item Number 1553. 7. Taung Child Skull reconstruction. (Australopithecus africanus. Prehistoric Planet Item Number 1565. 8. (Homo habilis) Skull, specimen #KNM-ER 1470. (Homo rudolfensis). 1.8 to 1.9 million years ago. Adult Cranium. Koobi Fora, Kenya. Described by R.E.F. Leakey, 1972. Prehistoric Planet Item Number 1557. 9. Peking Man Skull. (Homo erectus. Prehistoric Planet Item Number 1560. 10. (Neanderthal) Skull. Forbes Quarry. Pleistocene European hominids of the early part of the last Glaciation, 110-125 thousand years ago. Forbes Quarry, Gibraltar, 1948. Prehistoric Planet Item Number 1559. 11. (Homo habilis) Skull, specimen # KNM-ER. A distinctive small face, teeth and braincase identify it from other Koobi Fora crania, Koobi Fora Kenya. Prehistoric Planet Item Number 1558. 12 . (Rooneyia omomyid) Skull. A fossil tarsiform primate of Europe and North America of the earliest Eocene. Prehistoric Planet Item Number 1737. 13. (Proconsul) Skull. Cranium from an ancestral homin. Early Miocene of East Africa, 22 million years. M.D. Leakey, 1948. Prehistoric Planet Item Number 1561. 14. (Zinjanthropus) Skull, (Australopithecus boisei). 1.8 million year old adult cranium of Olduvai Gorge, Tanzania by Mary Leakey. Prehistoric Planet Item Number 1566. 15. Mrs. Ples Skull, (Australopithecus africanus), specimen # STS 5. Prehistoric Planet Item Number 1554. 16. 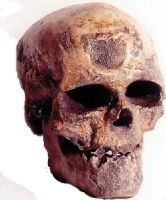 (Cro-Magnon) I Skull. Homo sapiens. 30,000 year-old cranium of a middle age male. The earliest definitive modern human from Western Europe. Cro-Magnon, France. Prehistoric Planet Item Number 1388. 17. (Homo ergaste)r Skull, specimen #KNM-ER 3733 Skull. Confirmed the coexistence of Homo and Australopithecus in Eastern Africa. Considered a female. Koobi Fora, Kenya, 1556.